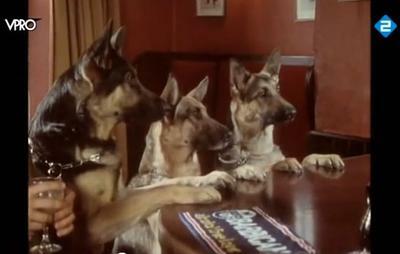 "3 German Shepherds walk into a British Pub..."
This video is hilarious. The actual video shows what happens next. Plus, if you're a fan of dogs, (German Shepherds in particular) English pubs, funny situations, or stupid pet tricks - then this will be 4 minutes of fun for you! The video stars 3 gorgeous German Shepherds in a bar - and I'll leave the rest to the video. It's not very long but so much fun to watch. Originally it appeared in BBC's That's Life! show. Three German Shepherds can be seen enjoying a game involving a soda siphon and a Japanese speaking bar owner. Definitely check this one out - you'll love it! What a wonderful video - and it's so funny, one of our readers sent me in an email about this very same video just a day or so ago. I love it! Thanks to Misha and Lynn both on this one!